Pets in childhood: Never had a pet as a child. Calvin and Hobbes are my first pets. Any special favourite: Though I love them both, Hobbes, the Golden Retriever, is close to me! Incident you would like to share: When we first took them to swimming, it was a treat as they are natural swimmers. Hobbes loved the water; he kept diving in and out! Calvin, the Lab, was as lazy as ever, swimming a bit and then lazing on the stairs of the dog pool. Special antics you cherish: I love it when Hobbes does a little dance on the sofa when he sees me after a gap. Hobbes has a funny bark when he misses you, and Calvin is possessive about my dad… no one can touch him when Calvin is around! Calvin is very cute when he wants food – he just stares at you with those lovely eyes, making your heart melt. Spending time with your dog: I play whenever I get a chance. Sometimes they sleep on the bed with me; other times it’s fun to tease them with a toy or something. Favourite activity together: Calvin likes sleeping in my lap while Hobbes likes to chase me for my hairband. Annoying habits: Calvin barks when you say ‘bye bye’ while Hobbes eats cotton! What you love most about them: They love me to unconditionally except the food of course! Seriously, they make all the day’s troubles go away! They are so intelligent and funny! Love it when I say ‘Let’s go for a bath”. Calvin hides between my legs, Hobbes can’t wait to take a bath! And they both love long drives. What do you think your dogs love most about you: That I give them treats! What is a special treat for your dog: Lots of them- biscuits, special doggy treats made of beef, chicken, lamb, fish, etc. Your pet’s favourite dishes: Hobbes loves mangoes, watermelons, and chicken-anything! Calvin loves ice cream, chicken, but he is a bit choosy. Tip you would like to share: Keep the weight in check! And it’s always good to groom them everyday. http://www.dogsandpupsmagazine.com/wp-content/uploads/2017/05/1254nal.jpg 0 0 Dogs and pups Magazine http://www.dogsandpupsmagazine.com/wp-content/uploads/2017/05/1254nal.jpg Dogs and pups Magazine2010-11-10 00:00:002013-09-12 15:49:00Do you know who loves me? Dan Borris is a well-known photographer, widely recognised for his portraitures, which have appeared in many leading magazines as well as used by many corporates. Interestingly, Dan didn’t get into dog photography (other than personal photos of his own dog!) until he started on the Yoga Dogs project. “That was about four years ago… and I’ve learned a lot since then!” he said. The idea rolled suddenly. “A friend of mine thought it would be funny to do photos of her and her English Bull Terrier, Otis, while she was practicing yoga. Otis was always sniffing around or licking her while she was in a pose. I laughed and said wouldn’t it be funnier if Otis was doing yoga. That was the beginning,” he shared. “The first calendar was the 2009 Yoga Dogs published by Brown Trout in the US. I had sent sample images to them with the idea of making a calendar. They thought it would be great… and it has been! The first shoot I did was with our dog Mela, a yellow Lab-Golden Retriever mix. Alejandra worked with Mela while I shot the photos. We had made a plan for the shoot, and Mela was pretty easy to work with, but of course Mela had some other ideas!” he shared. But how does he get the exact pose? “I start with many photos of the same dog. Alejandra gets them as close to a position as possible. We always, always make it fun for the dog and never pressure them. The process of shooting the photos can be pretty funny as you can imagine. I then go to the computer and edit until I find the right combination of shots to make the pose. It’s a long process in Photoshop,” told Dan. The 2011 calendar is based on the theme of Yoga puppies and Yoga kittens. It is available for sale at www.yogadogz.com. So, what are you waiting for? If you wish to have the pictures of these lil’ performing artists, grab your copy now! http://www.dogsandpupsmagazine.com/wp-content/uploads/2017/05/1254nal.jpg 0 0 Dogs and pups Magazine http://www.dogsandpupsmagazine.com/wp-content/uploads/2017/05/1254nal.jpg Dogs and pups Magazine2010-11-10 00:00:002013-09-27 14:51:25The Lil' Yoga masters! Our furry friends are considered to be the best conversation starters who help their human friends know each other. There are instances of people even getting married through conversations started by their pooches. Let’s find out how it happened! Dogs are man’s best friends. I’m sure that many a time you must have come across this term. But have you ever heard of people saying ‘Dogs are best conversation starters’? Let me tell you why. 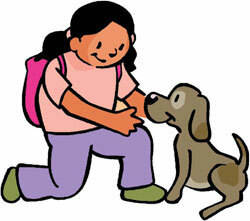 On your daily walk to the park, give a little attention to fellow walkers who come along with their dogs. You will notice that they are the ones who exchange the most number of ‘Hi’ and ‘Hello’ and they are the people who wear smiles permanently even with sweats dripping down their jaw lines as they exercise. Dogs, irrespective of their breeds and looks, tend to attract conversations. Being a canine companion, I have made friends with people who have approached me just to pat my dog. I also know a couple who fell in love and got married through these ‘doggie’ conversations. Sarika was a weight conscious woman who bought a dog, Cujo, thinking that the pet will motivate her to go on daily walk and also be a companion to her lonely life. Companion and motivation had certainly been what Cujo turned out to be. One day, on their regular high-intensity walk, Sarika noticed an average looking, trying-hard-to-exercise guy, jogging passed her. On the third day when they crossed paths, the guy (Manoj) shouted out a “Hey!” With knitted eyebrows, Sarika shot back a look and said, “Do I know you?” Pat came the reply, “No, but I was talking to your dog, what’s his name?” “Ask her directly”, said Sarika. But even before she realised, Cujo was wagging her tail and extended the handshake for friendship. With another exercising companion, Sarika, Manoj and Cujo cemented their relationship…three years later; Manoj and Sarika are happily married and Cujo stands as a testimonial for conversation starter. Loneliness is the first thing that will be ruled out once a dog steps in to your life. From single people to families with children to everyone with dogs in their lives show willingness to get out there and make friends and may be smile at strangers. Adolf Hitler too had a dog named Blondi. The dictator that he was, he also felt the need of having a companion, someone more than his human followers. Hitler was very fond of Blondi, keeping her by his side and allowing her to sleep in his bedroom in the bunker, the affection not even shared by his girlfriend. It was learnt that Hitler would talk to Blondi on a day-to-day basis. So, next time you hear a greeting directed at you when you are accompanied by your dog or if you make friends with like-minded people through such conversation, don’t forget to give your dog a much deserved tight hug. It’s good for your soul. It’s time to type out my TV trauma. My two-legged parents call it ‘idiot box’. Yet they gather in front of it every night… hypocritical hawks! Grrrhmphhh…! My two-legged siblings call it ‘time-pass’. After all, to not be tuned in to the latest sporting drama is a faux pas. I call it ‘Temptation Island’ because television is like fantasy land…Rather, it is utopia. I ask you… where else does it rain balls day and night? Add to it…the replays and highlights! golf balls juggling around me! And it’s driving me crazy! C-R-A-Z-Y! They throw, they fetch. They kick, they catch. They hit, they head bang. They shoot, they smash. They also trip, slip and crash. What fun! It sure looks like living heaven! How I wish someone would invent a TV where I could jump in and join the real action… Or maybe even initiate a sporting event called Canine Catch Cup? What say? All those in favour, yell HIP HIP HURRAY. Or Waka Waka woof woof in your own special way! http://www.dogsandpupsmagazine.com/wp-content/uploads/2017/05/1254nal.jpg 0 0 Dogs and pups Magazine http://www.dogsandpupsmagazine.com/wp-content/uploads/2017/05/1254nal.jpg Dogs and pups Magazine2010-07-20 12:16:112013-12-13 12:35:38A page from the diary of a doggone doggy! Man’s association with dogs dates back to centuries. The ubiquitous dog has been considered man’s best friend for as long as this universe existed. So, have our Gods also felt the canine love? Sure, here’s more on our legendary canines! Lord Shiva’s various incarnations: Bhairava is Shiva’s fierce manifestation, who is accompanied by a dog. Feeding and taking care of dogs is another way of showing devotion to Lord Bhairava. So, devout Hindus on a pilgrimage to Kasi (Benares) visit the temple of Kalabhairava without fail and they believe that the best way to seek His divine blessings is to feed sweetmeats to 11 dogs every Saturday. Another incarnation of Lord Shiva in other parts of India known as Khandoba, also had the same attributes. Legend has it that Khandoba rode on a dog. Deities such as Rudra and Virabhadra, both incarnations of Lord Shiva, were associated with dogs, and a soubriquet describing Rudra characterizes him as ‘shvapati’ or ‘master of the dog’. 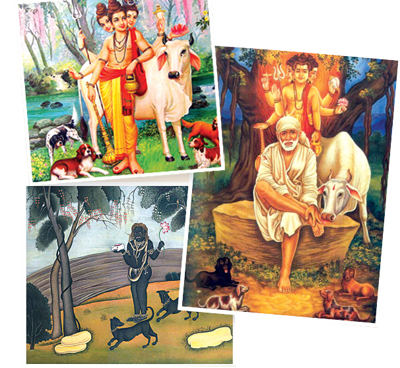 Lord Dattatreya: Lord Dattatreya has four dogs, considered to symbolize the four Vedas – Rig Veda, Yajur Veda, Atharva Veda and Sama Veda. They follow the Lord as “hounds of heaven -and watchdogs of truth” and are owned by Datta, the greatest hunter for the souls of men. Yama: Who doesn’t know Yama, the God of Death, who had two ferocious dogs, the offspring of Samara, which guarded the herds of Indra, the king of gods? These dogs reportedly wander among men as messengers of Yama. They also guard the roads leading up to His abode. Yudhishtira: The last part of the Mahabharata narrates the story of Yudhisthira, the eldest of the Pandava brothers, during his journey to heaven. At the peak of Mount Meru, Yudhisthira met Indra, who refused to admit Yudhisthira to heaven because he insisted on bringing along a stray dog, which according to Indra, was an unholy creature not worthy of a place in heaven. This dog had been a faithful companion to Yudhisthira throughout his long journey on earth. When Indra questioned, “You can leave your brothers behind, not arranging proper cremations for them…and you refuse to leave behind a stray dog?” Yudhisthira replied, “Draupadi and my brothers chose to leave me, and it is not I who left them.” Saying thus, he refused to go to heaven unless the dog was allowed entry by the sentry. At that moment the dog changed its form into God Dharma, Yudhisthira’s father, who was only testing his son. Kunnathurpadi Sree Muthappan temple: Have you ever heard of a temple where two majestic dogs guard the royal deity? Yes, I am referring to the Kunnathurpadi Sree Muthappan temple in Kerala’s Kannur district. Dogs are considered sacred at this temple and one can see plenty of dogs roaming inside and around the temple. Devotees feed these dogs and the camaraderie between man and his best friend is very much in evidence here. Bronze temple dogs guard the sanctum sanctorum of the temple, which is a concrete structure with tiered roofs that is supported by pillars and decorated with elephants. Even today, the glorious legend of the dog is carried forward by the devout, who care for the animal and feed it religiously at least to cleanse their sins and guarantee a berth in heaven, if not for the love of dogs. Shirdi Sai Baba – a dog lover too: Anyone who has visited the holy shrine of Shirdi will not miss the divine sight of scores of stray dogs roaming freely within the temple premises unmindful of the lakhs of devotees milling around them. 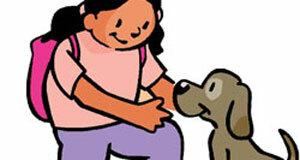 It is believed that Sai Baba loved dogs immensely. Thus, dogs have a sacred place in our hearts and lives and when they are associated with our Gods, they are divine! http://www.dogsandpupsmagazine.com/wp-content/uploads/2010/11/mythical1.jpg 134 250 Dogs and pups Magazine http://www.dogsandpupsmagazine.com/wp-content/uploads/2017/05/1254nal.jpg Dogs and pups Magazine2010-03-20 00:00:002013-09-27 14:53:09The mythical canines! My female dog Miu is a Bujop Chi Mollosser breed from North East India. Since she is a Himalayan breed, I gave her the name Miu meaning doll in Tibetan. I have named my Chow Chow breed Koda because he is huggable and lovable like the bear in Brother Bear movie. My Labrador was named Allan because it is customary in our religion while assigning name to a baby to take first alphabet from our holy book. Starting with the alphabet ‘A’ which is a variant of the name Alan (Old German) and Allen (Gaelic) and the meaning of Allan is ‘Precious’ (as he is precious too). http://www.dogsandpupsmagazine.com/wp-content/uploads/2017/05/1254nal.jpg 0 0 Dogs and pups Magazine http://www.dogsandpupsmagazine.com/wp-content/uploads/2017/05/1254nal.jpg Dogs and pups Magazine2010-01-20 00:00:002013-09-12 15:58:13What’s in a name? While many of you, would be counting what you and your beloved pooch have in common, here are a few scientifically proven facts about the similarities we have with our pooches. Only two of us have prostates: Dogs and humans are the only living beings who have prostates. What’s more, even the canine prostate gland and its diseases are very similar to that of humans. We both can be a lefty or righty: As per the Institute for the Study of Animal Problems in Washington DC, dogs, like people, are either right- or left-handed. And we just wondered whether our baby would be a lefty or righty! Do you know whether your pooch is a lefty or a righty – no, so, what are you waiting for? Just check it out. We play the same game to woo our women: How many of you males have let girls win, even if you could have easily won the game? For most of you, a game lost now is love earned; our pooches also let their lady love win. 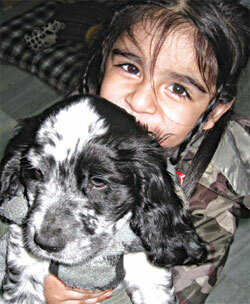 We behave the same way: Our pooches are the best models for understanding social behaviour. We share similar traits like co-operation, attachment, ability to imitate, etc. And this is all because humans and dogs have been friends for time immemorial and they have lived together for centuries. We both feel jealous and hurt: Jealousy and feeling hurt are universal emotions and guess what our little pooches feel the same way to. So keep this in mind, handle his heart with care. My pooch is my baby; here are reasons why I can’t live without her. Warm hearty welcome: She is always happy to see me when I am back home. She always welcomes me with a wagging tail and a happy mood. Unconditional love: She is always there to love me and listen to my woes. No complaints: She never complains about bad weather, people or any other thing. Companionship: She always gives me good company. She is a companion I can rely on. Free spirit: Her zest for life is contagious. Whenever I am with her, I remember to enjoy life’s little pleasures. Spend the lazy summer afternoons, watching a doggie flick which both you and your pooch would like. Here’s a list of top 10 most admired doggie movies. Summers have set in…the scorching heat deters you and your pooch to spend more time outdoors. But despair not for there would just be few things which could be more fun than curling up on the couch with your furred friend and bond over a movie. Choose from the Top Ten List of Pooch Flicks–all of which are sure to be loved by adults, kids and canines alike! This Walt Disney classic is a delightful watch for the whole family. The story revolves around the unlikely romance between a pure bred and uppity female Cocker Spaniel (Lady) and a free-spirited, rebellious male mutt (Tramp). Lady feels hurt and neglected after her pet parents Jim Dear and Darling bring home a new baby. The movie is both touching and funny; and also has a strong message for pet parents who are expecting a new addition in the family. One gets to see things from a dog’s point of view and learns how a pet dog feels when the family equation is suddenly altered one day. Touted as one of the all-time classic dog films, this is a heart rending story about a loyal Collie named Lassie. Her poverty-stricken family is compelled to sell her off to a wealthy duke. But Lassie would do anything to get back to her original pet parents. Lassie’s love and loyalty epitomizes what all dogs are about. This tear jerker is sure to melt your heart. The success of this movie inspired several sequels and even a television show. Old Yeller is the finest among early Disney dramas. This classic dog movie is a sensitive and evocative tale of a stray mutt called Old Yeller. Little Travis is hesitant to adopt Yeller so much so that he flings rocks at him. However, he undergoes a change of heart after Old Yeller proves his mettle as an ideal dog. The dog helps the boy get over the grief of losing his first dog Belle and the movie traces a journey of personal growth in both of them. The climax of the movie is sure to make even the toughest of men shed a tear. Watch this with a bundle of tissue papers and a bucket. Even after decades of its release, Old Yeller still remains in the heart of many a dog lover. It’s difficult not to love that shaggy-haired mutt known as Benji. Benji is taken in by two kids – Cindy and Paul but their father is strictly against having a stray dog in the household. One day, Cindy and Paul are kidnapped and nowhere to be found. Already a favourite among the townsfolk, Benji transforms into a true canine hero after tracking down and rescuing the two children. Even today, many owners name their pooches after this intelligent mutt, Benji. Eight Below is an inspiring story about brave sled dogs. Jerry shares an intense bond with his set of six Huskies and a couple of Malamutes. He treats them like family members. However, during an expedition, foul weather demands that the loyal dogs be left behind. A long and tumultuous journey in the Antarctic snow begins and the courageous and adorable dogs battle against all odds to survive. In the meanwhile Jerry looks for funding and means to get back to Antarctica to save them. This touching story is inspired by a true incident that took place in 1958. The dogs really steal the show by displaying their unique personalities and facial expressions. This slopy but lovable pooch has inspired many kids to ask for a pet dog as their birthday present. Beethoven is a St. Bernard pup whose clumsiness often results in a comic mayhem. Beethoven escapes from the clutches of dog-nappers and lands up at a Newton family’s residence. The kids immediately fall in love with the adorable pup but their dad resists the idea of letting the dog stay. Since nobody comes to claim the pup, the father has no choice but to relent. Beethoven grows up into a lovable, slobbering and messy dog who helps the kids cope with the pains of growing up. Trouble crops up when a cruel doctor wants Beethoven for a dangerous experiment…see the movie to know the climax! Homeward Bound traces the adventurous journey of a Golden Retriever named Shadow, a Bulldog named Chance, and a Himalayan cat named Sassy. The trio is separated from their family following a course of events. It takes a lot of stunts and surprises before they can be reunited. The animals put up a commendable act throughout the movie and the action stunts are worth watching. This Disney flick centers around a cuddly bunch of spotted puppies and their loving parents Pongo and Pedrita. The Dalmatian couple lives with caring owners and is enjoying their first brush with parenthood. Trouble brews when the quintessential vamp Cruella Devil naps the puppies to make expensive coats out of their fur. Pongo and Pedrita have faced with the challenge of rescuing their children but it turns out that there are 99 puppies in all waiting to be freed from Cruella’s cruel clutches! Air Bud is a high-flying entertainment extravaganza for kids. This dog tale is packed with silly antics, goofy baddies and loads of adventure. The movie centers on the relationship between a fatherless child Josh and a tortured, abandoned dog named Buddy. Josh soon finds out that Buddy is no ordinary dog- he can perform all sorts of acrobatic stunts and can slam dunk like a pro! Most importantly, Buddy helps his new master deal with the grief of losing his father and begin life afresh. Watch this movie and enjoy the bond of love loyalty and friendship between human and canine. Touted as one of the most delightful ‘cop and dog’ movies, Turner and Hooch features Tom Hanks as detective Turner and a French mastiff named Hooch. The sleek sleuth ends up with a mischievous and incorrigible dog to jointly investigate a murder mystery. The awkward relationship between the detective and the dog makes for some good laughs and their progression to close bond of friendship is quite touching.